Mahmoud Abdul-Rauf grew up in Gulfport, Mississippi, with a single mother who faced poverty throughout his childhood. Abdul-Rauf struggled with school when he was young until realizing that these struggles were due to his Tourette Syndrome. Once Abdul-Rauf was properly diagnosed, he was placed into special education classes. While the tourettes mad a lot of things harder for Abdul-Rauf, such as him suddenly needing to tap his belt buckle while sitting down, it actually helped him with his basketball career. One of the ways it helped was by him needing to swish ten jump shots in a row and needing to shoot free throws until he was able to shoot it with the perfect amount of arc before he would let himself leave the gym. “IT holds you there beyond your control. IT won’t let you leave until you take that basketball that you long to put down, and put it through the hoop 10 times in a row without so much as hitting the rim” (Zierk). This extra shooting practice he got lead to him to being one of the greatest shooters of all time and even one time in practice, when his coach allowed the team to cut minutes in practice by making consecutive free throws, Mahmoud made 283 consecutive free throws leading to his coach dismissing the entire team in amazement. Mahmoud Abdul-Rauf had an amazing high school career at Gulfport High School culminated in him being named a McDonald’s All-American and getting an offer to play at Louisiana State University. At LSU Abdul-Rauf would average 29 points per game and lead the SEC in scoring both his years there. He would go on to win SEC Player of the Year in his freshman and sophomore seasons despite playing with future NBA Hall of Famer Shaquille O’neal (Sports-Reference.com). Following an astounding two year career at LSU, Abdul-Rauf decided to leave college early and declare for the NBA Draft where he would selected third overall by the Denver Nuggets. Mahmoud came into the league with very high expectations and was thought by many to become a star right away. However, Abdul-Rauf entered the league and was terrible. Abdul-Rauf finished his rookie season averaging just 14 points per game and his numbers got even worse for his second season where we would average just 10 points per game (Basketball-Reference.com). Following his second season in the NBA, Mahmoud decided that he needed to get a new mindset and converted to Islam. With this new religion, came a new clear mindset for Mahmoud. He came into his third year and showed significant improvement to his game. He would average 19 points per game was named the NBA’s Most Improved Player. Following this season, Mahmoud strengthened his connection to his new religion by changing his name from Chris Jackson to Mahmoud Abdul-Rauf. Abdul-Rauf would continue to build on the success he had finally begun to find during the 1993 season and would help carry the Nuggets to the playoffs in 1994 and 1995. In the 1994 playoffs, Abdul-Rauf and teammate Dikembe Mutombo would lead the Nuggets to a playoff series win over the Seattle Supersonics becoming the first 8 seed to ever defeat a 1 seed in the playoffs. Mahmoud had appeared to cement his place in the upper echelon of NBA players until the 1996 NBA season. During this season, Mahmoud Abdul-Rauf decided that he would no longer stand for the national anthem. He believed that the anthem stood for oppression of Islam and that as a Muslim it was his duty to not stand for it. Abdul-Rauf’s protest would continue for the first 6 months of the season without anyone criticizing or paying any attention to his actions. However, in March of 1996, an NBA reporter noticed Abdul-Rauf’s sitting during the national anthem and wrote an article about it. Suddenly, the entire world took notice and he received heavy criticism from the public. He was immediately suspended by NBA Commissioner David Stern for one game for violating the rule requiring players and coaches to stand for the anthem. Despite Abdul-Rauf agreeing to stand after the suspension, the damage to his career was already done. Everything he did began getting criticized by fans and the media. He was called selfish for fasting for Ramadan despite the fact that no one cared when Hakeem Olajuwon has been fasting for Ramadan his whole career. Abdul-Rauf was traded by the Denver Nuggets to the Sacramento Kings just 3 months after the article about his not standing for the anthem was written. 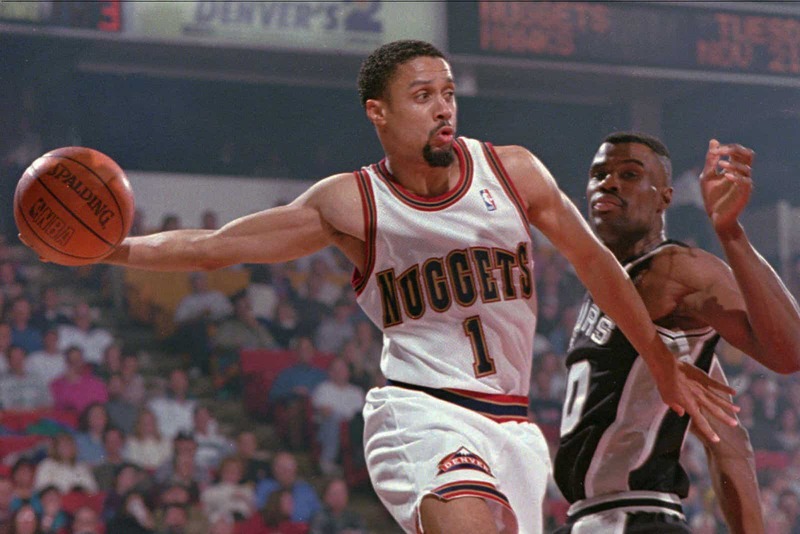 Mahmoud Abdul-Rauf believed that both the Nuggets and the Kings were involved in blackballing him from the league. He said that feels the teams changed his minutes to mess up his rhythm because the teams couldn’t just not play a player of his caliber in their prime. Once he was traded to the Kings, his career numbers would never go back to what they were between the 1993-1996 seasons. Abdul-Rauf would never average over 13 points per game for the rest of his NBA career and was forced to sign in the Turkish Basketball League after no teams wanted him just two years removed from averaging 19 points per game and leading the league in free throw percentage. In 2016, Former 49ers quarterback, Colin Kaepernick took part in a similar protest when he refused to stand for the national anthem due to the injustice racial minorities were being treated with in the US (Wagoner). While like Mahmoud, Kaepernick was hit with heavy criticism, his protests were different in the sense that Kaepernick also gained lots of support from teammates and fans. Even though Kaepernick wouldn’t play another down in the NFL after the 2016 season, he would continue to be seen as role model by many was named GQ’s 2017 Man of the Year. Kaepernick’s protest also resulting in him becoming the face on Nike’s “Just Do It” campaign. For Mahmoud it wasn’t like this, it was just a large group of americans who were against him and very angry about the situation. While both players believe that they were blackballed from their respective sports, Kaepernick was seen as a hero and Abdul-Rauf was seen an unpatriotic person. While there is no definitive proof that Mahmoud Abdul-Rauf’s were the reason he went from a 19 point per game player to out of the NBA and playing overseas in just 2 years he certainly believes that it played a significant factor. Despite this fact, and despite him losing millions of dollars in potential salary for these protests, Mahmoud has stated that he has zero regrets. Mahmoud helped pave the way for future change and were starting to see other take part in similar protests. Although Mahmoud’s protest didn’t gain support in the same way the Colin Kaepernick did, his effort to cause change was significant and will never be forgotten.